It's got the subtitle "The beginner's guide to the rockabilly style" and it covers the very basics of guitar playing incl. tab-reading and advice on strings and picks a.s.o. 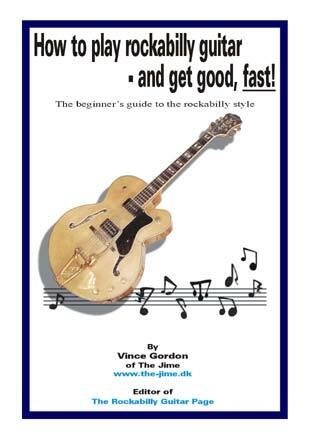 It's far from just a beginner's guide to guitar playing though, it's mainly an introduction to the rockabilly guitar style and the art of improvising within that genre. It also shows you how to play many classic rockabilly riffs, chords and some guitar boogie bass lines besides two scales, so you have something to build on. It's 33 pages including cover. It has tabs, chord diagrams, pictures and the text doesn't require any previous technical musical knowledge to understand. If you're an intermediate or advanced player, this book is probably not for you. I refer you to my eBook "Intermediate Rockabilly Guitar Lessons" instead.